In the first stage, the output module is the fluorescent indicator that can monitor the real-time processes of our system. Once its function is confirmed, we can use other functional parts as output to solve real world problems. Beside fluorescent proteins, we try to use an RNA-fluorophore complex (Paige et al., 2011) to monitor the real-time processes. 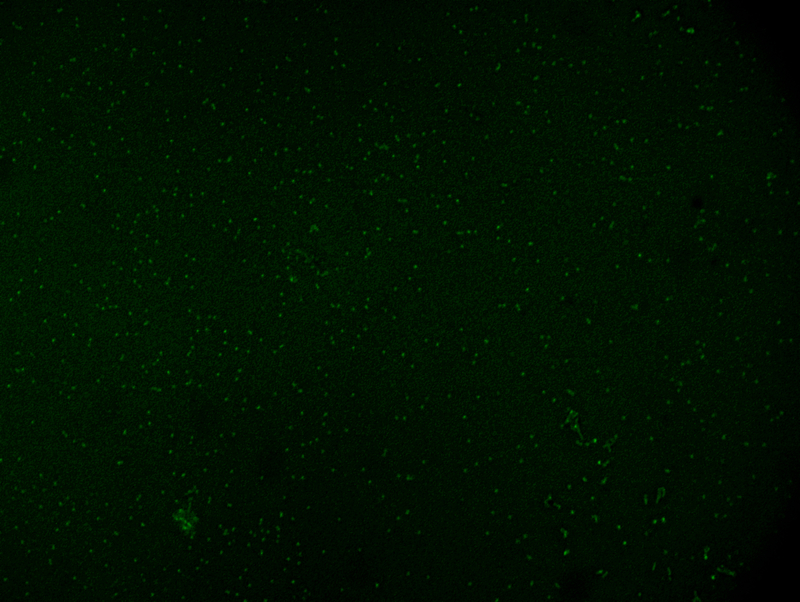 The complex contains RNA aptamers and some corresponding fluorophores. We synthesized the fluorophore 3,5-dimethoxy-4-hydroxybenzylidene imidazolinone (DHMBI), because several aptamers were identified that exhibited markedly different spectral properties when they bound to DHMBI. We also synthesized the 13-2min sequence, one of the aptamers that can interact with DHMBI, with a modified tRNA scaffold, which can stabilize the structure. Figure 1. The resulting image under the fluorescent microscope. Paige, J. S., Wu, K. Y., & Jaffrey, S. R. (2011). RNA mimics of green fluorescent protein. Science, 333(6042), 642-646.